If Americans audiences know of Cantiflas, it is due exclusively to his appearance in Michael Todd's opulently lavish adaptation of Around the World in 80 Days, which remains one of the most shocking Best Picture winners in history (beating out both Giant and The Ten Commandments). Around the World in 80 Days is generally derided as one of the worst Best Picture winners, and that conversation is for another day (and for the record, I think Giant should have won). Around the World in 80 Days was Cantinflas' first English-language film, and one of only two he made in the language (the forgettable and embarrassing Pepe being the other, and the less said about this unfortunate stumble in Cantinflas' career the better). Despite the language barrier, Mario Moreno, the person who created the Cantinflas character, is recognized by cineastes as a true comic genius. No less a talent as Charlie Chaplin complimented Cantinflas when the Little Tramp called him 'the world's greatest comic'. The language barrier may be a difficulty in watching both Cantinflas AND Cantinflas, the biopic of his life pre-Around the World in 80 Days, but it is worth checking out if only to see both the rise of a great comic and two standards of Hollywood filmmaking: the "we GOTTA sign this star by a certain day" and "the tears of the clown" story. Cantinflas is anchored by the mad rush Broadway impresario Michael Todd (Michael Imperioli) to sign this Mexican comic, Cantinflas (Oscar Jaenada) to a small part in his epic cameo-drive spectacle. Todd pictures Cantinflas, the biggest Latin American star in the world, to play the part of a Native American chief. To Todd's surprise, Cantinflas is perfectly happy to turn Todd down, as he has turned down so many other American offers. The language barrier isn't the main stumbling block (as Moreno tells Todd, he can speak English when he needs to). Cantinflas a.) simply has no interest in American productions, b.) is someone who has total control over his films and sees no reason to exchange his hard-fought creative control for Hollywood fame, and c.) really thinks the role IS too small for him. Todd is highly anxious about signing Cantinflas, for without him the studio is threatening to pull funding. To Todd's surprise, he finds an unlikely ally, none other than Charlie Chaplin (Julian Sedgwick), who tells Todd he has been going about this wrong. Don't appeal to Mario Moreno, the British comedy icon advises. Appeal to Cantinflas. 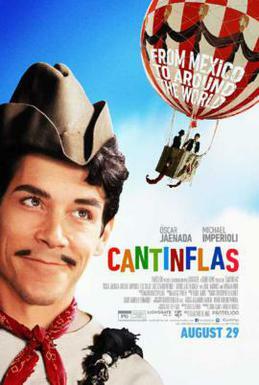 This serves as the narrative hook as we go through Cantinflas' life, from his early days working the tents (where he more or less fell into his comic persona) through his marriage to Valentina Ivanova (Ilse Salas), the Russian émigré making a career in Mexico, the strains on their marriage due to his constant work, their failure to have biological children together, and Cantinflas' growing alienation from his roots. While he rises in popularity among the Mexican and Spanish-speaking people (particularly the working-class he embodies in his Cantinflas character), Valentina thinks he is growing too close to the artistic and wealthy elite. Eventually, Cantinflas reaches both a personal and professional crisis, as his in-laws begin to snipe at him for his failures as a man and husband, the troubles he endures as head of Mexico's actors union, and the strains with Valentina. A personal note from Chaplin and the script for Around the World in 80 Days, this time with Cantinflas as co-lead, appear to win both Todd and Cantinflas far more than either expected. 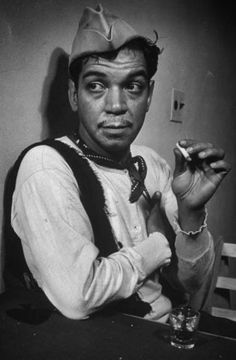 Cantinflas has the benefit of Jaenada's casting. This originally proved controversial as Jaenada is a Spaniard and not Mexican. The concerns were that Jaenada would not be able to accurately portray the Mexican icon: from his accent to the lack of physical similarity made him a dubious choice. However, just like Puerto Rican Jennifer Lopez excelled as the Mexican-American Selena and the Texan Renee Zellweger captured the very British Bridget Jones, the Catalonian Jaenada really did excellent as Cantinflas. His voice and mannerisms were spot on, sometimes shockingly so, in particular when he played Mario Moreno at home, where he looked radically different than 'Cantinflas'. He doesn't go for mimicry but for as close to a genuine portrayal as possible. It is more than looking like Cantinflas. It is going into the complex and even contradictory persona of both Moreno and Cantinflas where Jaenada does really strong work. It's almost a shame that some time is lost with Imperioli's Todd. It isn't that Imperioli is bad as Todd (though there doesn't seem to be much of a physical resemblance between the two). It just seems that Todd is there merely to tie the story together when a more straightforward biopic on Cantinflas would have worked just fine. This is especially true given how little we see of the making of Around the World in 80 Days or what Cantinflas thought of it all. The movie attempts to end on a triumphant note when we see Cantinflas winning a Golden Globe as Best Actor (beating out Yul Brenner and Marlon Brando), but the film also papers over more negative aspects of Cantinflas' life. While we get the idea that he had an affair with Czech actress Miroslava (who came to Mexico as a child and became a Mexican film star), the film flat-out never mentions her suicide, or that it might have been the a result of that affair. It also fails to mention Cantinflas' natural son, whom he and Valentina legally adopted. Cantinflas is in some way a sanitized version of Cantinflas' life. Still, on the whole Cantinflas is an entertaining film and an interesting look at an icon of cinema. It has a strong performance by Jaenada and while it doesn't dwell much into Around the World in 80 Days, it might serve as a good intro to someone wanting to know a bit about the figure who rivals Charlie Chaplin as perhaps the greatest film comic of all time.